It's baffling to think that it's taken until the year 2013 for Hasbro and Nike—two of the most powerful brands from the 1980s and 1990s—to finally team up and pay proper tribute to one of the best cartoon bad guys of all time. 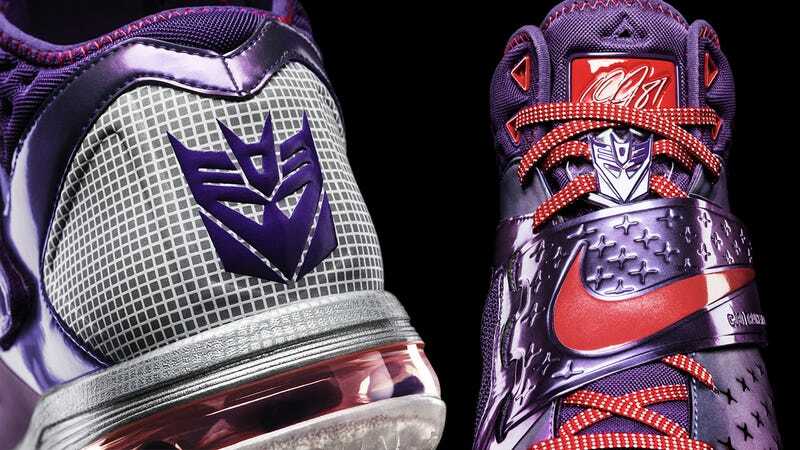 And while this isn't the first Nike and Transformers mashup, this amazing Megatron-themed set of shoes are the first that self-respecting Decepticon fans might actually want to wear. Inspired by Detroit Lions wide receiver Calvin Johnson, Jr. who's been nicknamed Megatron, the Nike CJ81 Megatron Trainer Max, Megatron Nike Air Trainer SC II, and Nike CJ81 Megatron Elite TD Cleat all feature colors, styling, and patterned fabrics that pay tribute to the Decepticons' esteemed leader—right down to a "Show no mercy" quote under the forefoot strap of the CJ81 trainers. The CJ81 Megatron Trainer Max and the Megatron Air Trainer SC II will be available soon at Nike stores and other locations across the country. But if you want a pair of the CJ81 Megatron Elite TD Cleats, you'll need to spring for the special edition $550 Megatron Rises three-pack.